Strawberry tart is a favourite German fruit cake in summer. When strawberries are in season we Germans like a delicious Erdbeerkuchen. Don't you love the smell of fresh strawberries (Erdbeeren)? 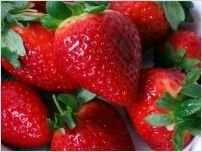 It is a favourite pastime for families to go to strawberry fields and pick (and nibble) the delicious red fruits to make strawberry jam, and all kind of wonderful desserts. Strawberries are seasonal, and you'll get local fruits from May until August. In my opinion, strawberries are the best in June and July. As with many fruits and vegetables, you can buy imported strawberries all around the year these days. I admit, I am somewhat old-fashioned in this respect. If fruits & vegetables have a season in Germany, I only buy them then, fresh and full of taste! This is a quick and easy recipe. It is a little bit like a sponge cake, but not so soft and delicate. If you are in a hurry, you can even use a ready-make sponge cake to make a yummy Erdbeerkuchen. Put the eggs into a mixing bowl, use a handmixer at the highest speed and whisk the eggs, add the sugar, vanilla sugar, salt and the soft butter. Continue whisking until the mixture is foamy. Grease a flat baking pan, sprinkle the pan with fine breadcrumbs, and fill in the dough and flatten. Bake in the preheated oven at about 200°C / 400°F for about 12 to 15 minutes until golden. Remove the cake and let it cool down on a wire rack. Wash and hull the strawberries, and put the whole fruits on the pastry. Cook a jelly-like glaze to coat the strawberries, you'll get Dr. Oetker Tortenguss Rot (Red Cake Glaze ) at Amazon.com to prepare such a glaze. Another way to glaze your Erdbeerkuchen is to use strawberry jam. Heat 3 tablespoons jam in a pot, use a cooking brush to spread the jam on the strawberries. The result looks better, and the taste is just delicious. Cook a firm vanilla pudding and spread it on the cake case, then top it with the strawberries. Sprinkle the cake with almond slivers. 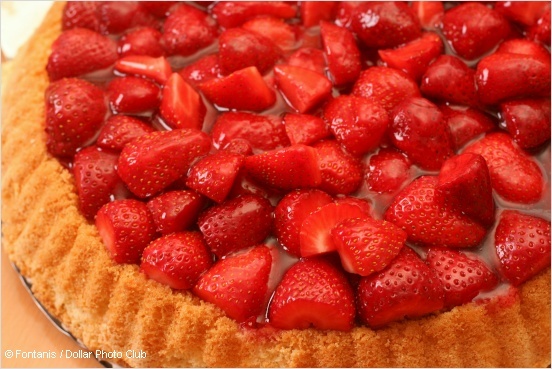 Use a shortcrust pastry base for your strawberry cake. 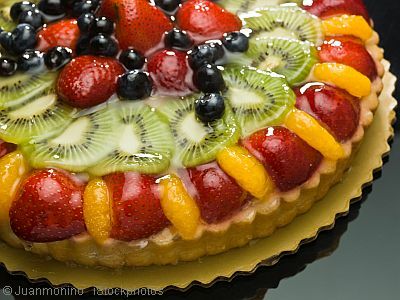 Of course you can prepare any other fruit tart (Obstkuchen) with this dough recipe. Fill the tart with fresh peaches, apricots, cherries, or berries, whatever is in season. If no fresh fruits are available, you can use preserved fruits as well. Enjoy your strawberry tart with whipped cream. Guten Appetit.